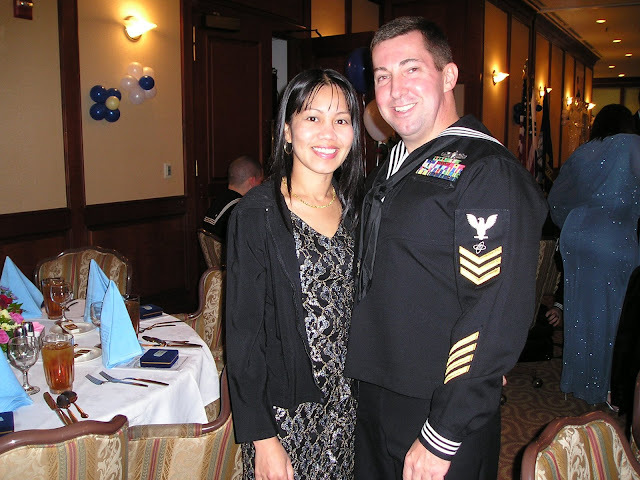 My husband served the US Navy for twenty years. He's been retired for over a year now and I can see how glad he is that he finally retired. Being in the service molded into a better person. It gave him a chance to travel the world (that's how he found me lol). Below are the Navy mugs that we bought in South Korea, his last assignment. We stayed there for almost two years before we came back here last year. Taken at the Navy ball that we attended in Korea. The first and last I have attended hehehe. I can tell that my husband misses working as a sailor but I am so glad that he is now retired. We finally settled down here and not worry about where to move next if he is still in the service. We are so proud of you Hon! May I please add my Thank You for your years of service to our Country. Thank you so much Ms. Wanda, that means a lot! You are obviously very proud of him, and so you should be. Love the photo of you both. you are a handsome couple, and I'm glad you found each other. Good choice for the letter N - the Navy has been good to you both. Perfect contribution for N-day! I have a soft spot for the Navy since two uncles served in WWII, one was a Sea-Bee. Love the USN coffee cups. Where in WV are you all located? We are in Lexington, VA. LOVE THE BLOG. You all always look so happy. thank your husband for his service. I have a friend who says he was in the service for 20 years and 5 minutes. My son is in the Coast Guard. I salute men in uniform....:) congratulations guys, buti pa kau retired na...ehehhee....si Greg sa June 15 yung retirement nya...weeeee...sa wakas! so John went to Philippines and met you. My filipina girl friend was in a bar, saw her Australian husband come inside. She told all her friends there that he was hers. and they got married. Hi Ann, I went to the Philippines long time ago but did not find Rose. I met her online when she was working in school. Love that Navy uniform! My father was in the Navy many years ago, and I love seeing photos of him in his uniform. What a great post for the "N" day!